The Tombs of Buganda Kings in Kasubi are regarded as the major spiritual centre for the Buganda people, the largest Ugandan ethnic group. The ‘Kasubi Tombs’, as the Tombs of the Buganda Kings are known locally, may be the only tourist attraction of Kampala (a capital city with 2.5 million inhabitants). And then came that devastating fire on March 10, 2010: the main thatched structure with the 4 tombs of the former kings and their regalia burned to the ground. The cause is still unknown: was it arson or was it struck by lightning? Anyway: it hasn’t been rebuilt yet. Still I found it an interesting site, and it is an easy place to visit shortly before leaving Uganda via Entebbe Airport. The tombs are situated on a hill about three kilometers outside of Kampala city centre. Due to a traffic jam my minibus from Entebbe had a hard time reaching the bus station, so I got out somewhere along the way and approached a boda-boda. The guy immediately understood where I wanted to go, and we took off zigzagging through the dense traffic. There are even a few signs along the way to announce the proximity of a world heritage site, a small detail that always makes me happy. One enters the site through the only original thatched building that remains after the 2010 fire. There are two guards at the door opening, each associated with a different Buganda clan that is in charge of security. The modern entrance including guest book and ticket seller is a little further inside the compound. There they tell me that women are required to wear skirts, but they do have a wraparound cloth that I can use to cover my pants. After the formalities (there’s a 10,000 UGS / 2.5 EUR entrance fee), I was introduced to a guide who would give me a tour of the site. The tour begins with the story of the origins of this place. 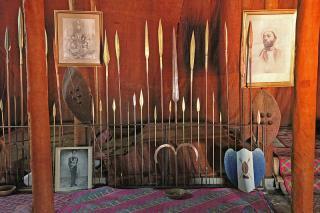 The Buganda kingdom dates back to the 13th century, and since then there have been 36 kings. During the English colonization in the 19th century they lost their worldly power. With the exception of a few brief intervals during the dictatorship of Obote and Amin in the 1970s and 80s, they have nevertheless kept their ceremonial function until today. The destroyed structure, an eight meter high circular building with a thatched roof, was the centerpiece of the site. The progress of reconstruction is slow. According to the guide that is caused by the many ceremonial rules that have to be followed. But the costs were an obstacle too: Japan recently has chipped in, and it is expected that at the end of 2016 the large thatched dome will be resurrected again. This main building is located on a circular plaza, with rows of houses around its edge. These houses belonged to the favorite widows of the deceased kings. The first king had as many as 84 women. Even today the descendants of the widows live on the property. There is a kind of village at the back where 35 people live permanently, and there is arable land for them to grow some food. At the far end of the site lies a cemetery where members of the royal family are buried. This is similar with the tradition of the Toro, whose tombs I visited a few days before near Fort Portal. Just like the Buganda, the Toro are one of the four remaining traditional kingdoms in Uganda. I'm glad I had been able to enter the Toro tombs and see the ceremonial possessions of the deceased kings, because here in Kasubi these have largely been lost during the fire. Near the exit lies the Royal Drum House. Drums are kept here that are used for ceremonial occasions, such as a visit of a member of the royal family or a death. Women cannot enter here, but you are allowed to take pictures from the doorway. This restored house shows how the reed layers are attached to make a thatched roof. My half hour guided visit ended at the shop where they sell paintings on bark cloth. They are pricey but seem done well to my untrained eye (I did not buy one). The tradition of the Buganda is closely connected with the production and use of bark cloth. The cloth fabric is made from the soft bark of the fig tree – there are still a few of those trees at the Kasubi complex and the guide had shown me these. Bark cloth has been manufactured in Uganda for centuries (until the introduction of cotton by Arab traders), and it represents Uganda's sole entry on the UNESCO Intangible Cultural Heritage List. It was a rainy day when I visited the Tombs of Buganda Kings at Kasubi in Kampala, Uganda, in summer 2014. The grey afternoon served as a fine backdrop to a World Heritage Site that had seen its share of troubles after a fire destroyed several of the buildings in 2010. The site had been inscribed for its cultural significance for the Baganda people, and the centerpiece was a large thatched house containing the royal tombs of four Buganda kings who reigned in the 19th and 20th centuries. When I visited, all that remained of the central house was a steel frame and a concrete platform awaiting reconstruction, all surrounded by a metal fence. Sheaves of straw were positioned around the hill in preparation for the repairs of some of the thatched houses surrounding the central house. I walked through the drum house and other houses that were not destroyed or had been rebuilt, and admired the craftsmanship of the roofs as seen from inside. One thing that surprised me in some houses was the presence of modern material such as concrete and steel in addition to traditional materials; these changes had been made in the 20th century. As I understand it, the overall reconstruction work of the tombs is still in progress, but I would love to see them once they are rebuilt. Logistics: The Kasubi Tombs are located in Kampala, and can be reached by private transportation. Many thanks goes out to the newly appointed katikiro(prime minister) of Buganda Peter Mayiga who has made efforts to solicit funds from all corners to reconstruct the largest grass thatched building in the world.I can't wait to see it finished this year as promised by him.Thank you UNESCO for the support incurred. A place a used to study about, every time I read about Buganda Muzibu Azaala Mpanga came across. To my minds this really indicated a treasure heritage. Today it may not look the same physically due to the destruction, but in belief of the Muganda it will ever remain there and his Heritage. It is attributed to the architectural development of Buganda for the past, a symbol of religion (traditional beliefs) which which is continuous up to today because many still regard it in the same manner like before. Having participated in the program of the youth world wide under UNESCO (World Heritage Volunteers 2012), it was an opportunity for me to know how important we should preserve it, how useful it is to generations to come; i can't finish them. And am yearning for this year's program again to participate in the construction to fulfill my dream of one of the participants of conservation practices at the once a state house for my former King "Muteesa 1". I am an architect and yes I have recently visited many of Buganda's cultural sites. They are in a sorry state but we have now appointed a team to look for ways of funding their rehabilitation. Anyone out there with a need for more information could contact the Katikiro Eng. J.B. Walusimbi or Owek. Nakiwala. My firm has been tasked with rehabilitating the Nagalabi site. This is where all the Kings have been crowned in the past. I wish I could attach some photographs for you to see the shame of our times. It is a once in a lifetime opportunity for me as an architect to revive my ancestry sites and we shall give it all our creative minds. Though I grew up in the Mengo/Namirembe, I never got the chance to visit the Kasubi Tombs. Whether it was out of fear or respect, I don't know, I agree, these are historical sites and should be rebuilt and maintained. Kasubi is one place that that all Ugandans should be proud of. Tribal differences in Uganda have resulted in a lot of loss to our heritage and the leaders ignore the country's heritages which in end, could have contribute to the GDP (this is not only for Baganda but it's for Ugandas'). Bugandas heritage is Ugandas heritage. I still call on Ugandans and the government of Uganda to start considering rebuild heritage site all-over the country. We also to stop working for building new structural plans compete out side the African continent, governments taking heritage site into barracks, and reconstruct these sites. I think we have got a lot more apart from wild life which is considered by the foreign tourists as the only attraction. It is excellence, but one thing that deteriorates this site is a number of visitors who pretend to on their vacations. In order to rebuild the site the ministry of tourism have to act on it, employ some more graduates in all other ways they could know what are they doing. When I was young at one time I visited the sites but know the difference is great. I think Uganda goverment and people of Uganda need to rebuild their heritage because thats Uganda's or Africans value. The tombs lie in Uganda's capital Kampala, in the Kasubi suburb. Henry Morton Stanley: The tomb of Muteesa I (1835-84) is "guarded" by a cannon brought to Uganda by Stanley in 1875 and given to Muteesa when the 2 met. Role of Women: The widows of the Kabaka play significant customary roles in the maintenance and ceremonies of the tombs. They have houses inside the compound. 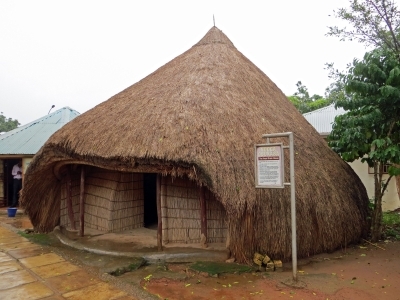 The primary building of the Kasubi complex is the circular Muzibu Azaala Mpanga with 4 Kabaka tombs and "One part of the great hut is known as the 'forest' or kibira. It is a secret area where the Kings spirits can hide. Only the widows can access to this part which is hidden behind a bark cloth curtain" (Nom file). Undergoing Restoration or Repair: The repair after the 2010 fire of the main thatched structure, that houses the tombs of the 4 former kings, is expected to be completed by the end of 2016. Masterpieces of Oral and Intangible heritage: "Bark cloth making is an ancient craft performed by the Baganda people who live in the Buganda kingdom in south Uganda"